As some of you regular readers may have noticed, I have been cooking with a lot of ingredients that cause stains. 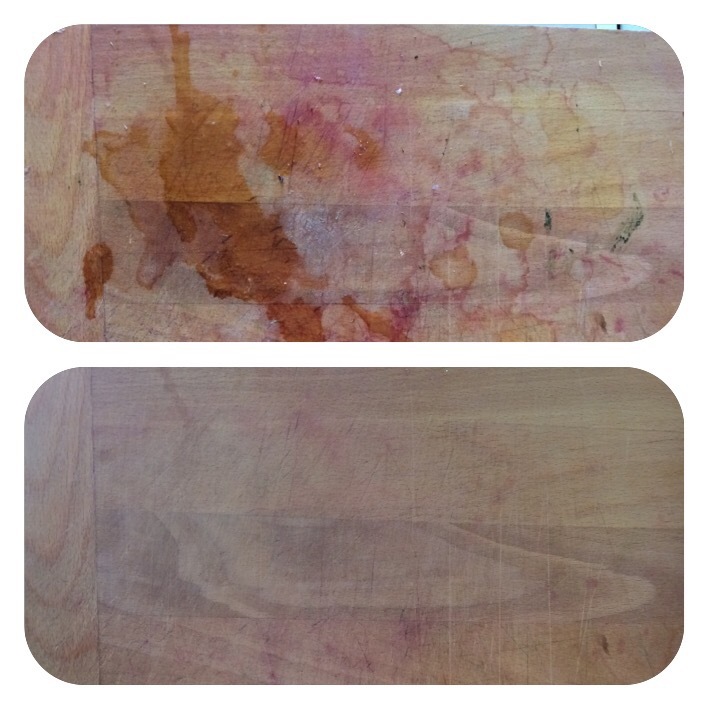 Specifically, the beets have caused my cutting board to have some stains that just wouldn’t come out with normal cleaning. I had remembered seeing a short video on Clean My Space’s YouTube account a while back about cleaning a wooden cutting board so I thought I would give it a try. Now I also looked around a few other cleaning focused blogs and of course Pinterest and all had a variation of this trick which made me more inclined to try it. What you need is a whole lemon, kosher salt, and of course a dirty cutting board. Step 1 – sprinkle the cutting board with kosher salt and the juice of half of one lemon. Using that half, scrub the salt and juice mixture around the cutting board. Let sit for ten minutes. Step 2 – repeat step one, well minus letting it sit for ten minutes. Step 3 – rinse of the cutting board and let dry. Top Photo – Before. Bottom Photo – After. Now I was a little suspicious that this trick wouldn’t remove stains from the wood. I mean beets stain like nobody’s business. However, the stains were almost completly gone at the end of this. I mean the board looked practically brand new. Well minus the cut marks. In addition, the board smelled much better. Before cleaning it had a slight garlic odor (because I use a lot of garlic). After cleaning, the smell was gone and just a fresh smell remained. I give this two spoons way up. Any cleaning trick that also removes odor is a winner in my book.